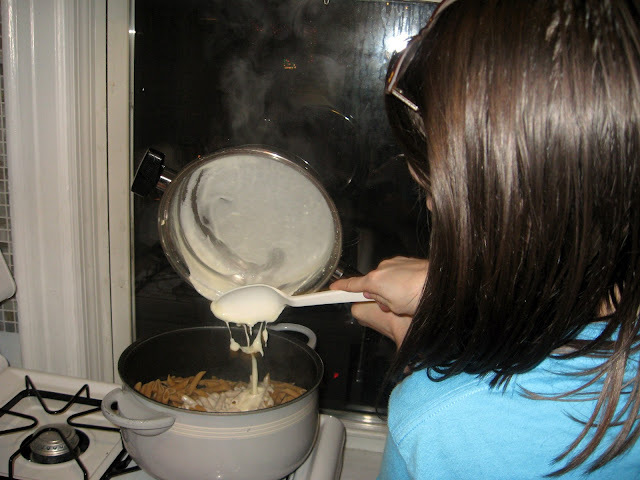 Today is National Fettuccine Alfredo Day! Admittedly, this recipe is only for the sauce. You can really use any noodles. As you can see, I used Penne. Because I had it. But, you know, if you have some fettuccine laying around, make this sauce and celebrate this holiday! Or, you know, this is also a perfect Valentine's Day dinner idea...just sayin'. Anyway, I LOVE this sauce-I'm weird about Alfredo sauces, some I love, others I hate. 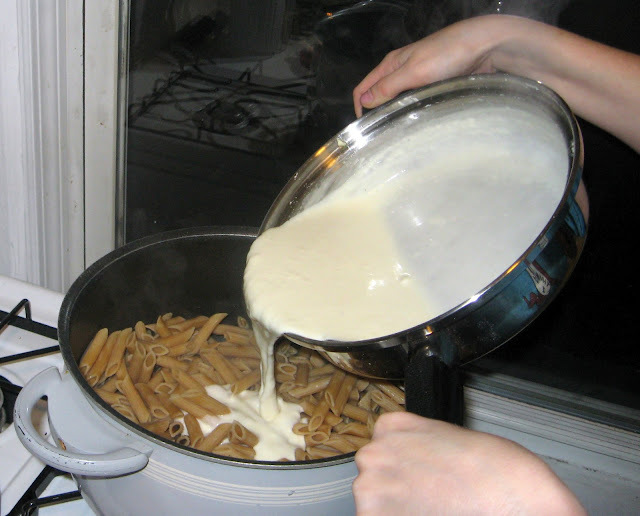 I've found I'm really not a fan of very heavy Alfredo sauces, I like it when they're a little lighter. This sauce is exactly right for me--its' most prominent flavor is the Parmesan cheese (or, if we're gonna get all Italian, the Parmigiano cheese), which I LOVE. It's health-ier, and not super heavy. All that said, I should probably admit: this is not Michael's favorite. It's not "creamy" enough to him. He likes it (especially fresh) but it is not his ideal. So, this is really a matter of preference. After you try this, you'll have to tell me--on Alfredo are you Team Kayle (lovin' this recipe) or Michael (more into a heavier, creamier sauce)? I'm looking forward to a debate that shall rival Team Edward vs. Jacob. 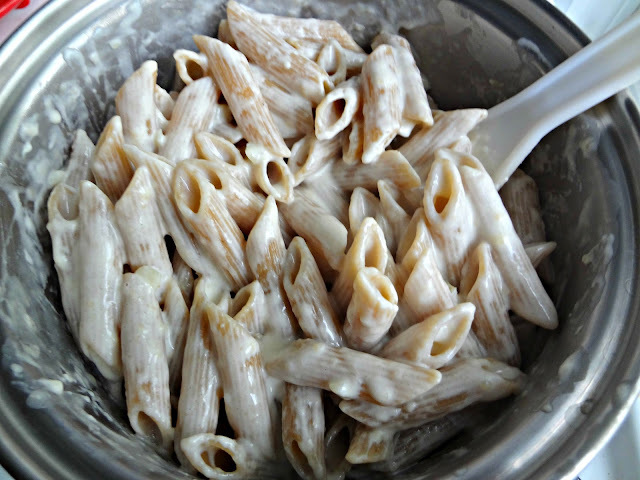 From Mel's Kitchen Cafe's "Creamy Garlic Alfredo Sauce"
In a medium pot/skillet/saucepan, melt butter over medium heat. Add garlic and cook about 2 minutes, stirring constantly, making sure to not burn the garlic! Add cream cheese and whisk until smooth to form a creamy paste. Add milk about 1/4 cup at a time, whisk quickly and constantly until fully incorporated. Serve immediately over hot noodles. 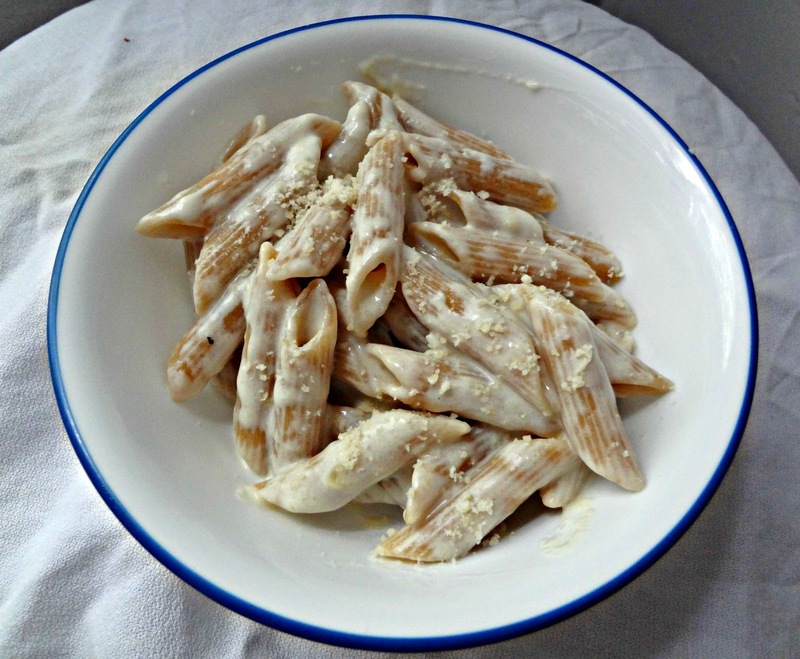 Like this awesome whole wheat Penne. Michael...or...*ahem* my "photographer assistant"-helped me out with the action shots. Yes...it was that dark outside. Winter, it gets dark early. Boyfriend, he works until at least 5 and comes home with a growling belly. You do the math. I love using a bit of cream cheese to make alfredo (instead of cream). It's creamy, easy, and healthier. Especially over that whole wheat penne!